“Ozasia is on fire!,” we announced enthusiastically in our 28 September E-dition, unaware that within several hours South Australia would be hit by the massive storm that took out the state’s power and flooded suburbs and towns north of the city. Shows were postponed, the festival’s food fair closed, attendees of the AAPPC conference were turned out of their hotel rooms into safe places and given blankets. We flew smoothly into a fierce headwind the next day to find that State Premier Jay Weatherill, anticipating a repeat storm that evening, had effectively shut down the city. We settled for SA garfish and oysters at Paul’s (the last of Gouger Street’s once thriving fish café scene] and an early night, sustained by a robust McLaren Vale tempranillo as the weather raged. Against the odds, OzAsia did not disappoint over the next two days as skies cleared, nor on the third, when rain forced The King of Ghosts out of the park into the far more comfortable surrounds of the Festival Theatre. 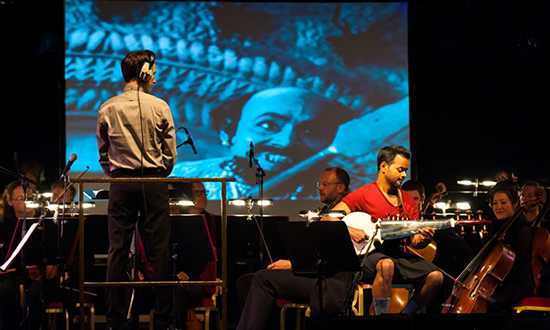 It proved an ideal venue for this shortened version of Satyajit Ray’s 1969 black and white fantasy comedy Goopy Gyne Bagha Byne (winner of the Adelaide Film Festival Silver Cross in the same year], screened to the lustrous live accompaniment provided by its composers—British sarod virtuoso Soumik Datta, Irish percussionist Cormac Byrne and Austrian conductor Johannes Berauer—and string and wind players from the Adelaide Symphony Orchestra. The score replaces Ray’s original instrumentation (he wrote, directed and composed] but remains true to its spirit. It also supplants the soundtrack, rendering the film and its characters silent, giving them instead new voices alongside the film’s subtitles. In the opening forest scene where Goopy (Tapen Chatterjee) and Bagha (Rabi Ghosh) encounter a tiger, the rustling of strings and winds conjures breezes, leaves and a cricket. When Goopy sings (voiced by Anup Kumar Ghoshal in the original], we hear the sarod soar with sweet passion. Percussion provides not only propulsion but many of the effects—in synch with onscreen drumming, water dripping onto a drum skin, a spear repeatedly plunged into a dummy king. dance. The King of Ghosts appears and grants the duo’s wishes for boundless food and clothing and slippers that will fly them wherever they want. The are also granted the ability to please with their music, which takes them to a music competition (in a superbly designed music room and with hilariously juxtaposed musical styles), which, with their unsophisticated fare, the pair win, becoming court musicians for a king and his brother—a king in another realm, whom they will eventually rescue from the designs of an evil courtier and (in a Technicolor burst) marry their respective daughters. There can be no substitute for Goopy Gyne Bagha Byne, here reduced to less than half its original length. At times, the volume and density of the score seemed too grand for an innocent comedy (Ray’s target audience was children, then all of India embraced it). But with the musicians foregrounded, The King of Ghosts proved to be fascinating, self-contained, virtuosic concert, a musically compelling and witty dialogue with a special film. Following some low key, playful routines built around a street painter, two musicians and two young men showing off with a little juggling to two girls who are warned by a policeman on monocycle to cover their arms and shoulders, Phare Circus swings into riveting action with the whole company dancing and tumbling over long poles pulled rapidly together and apart at floor level. There’s a tremendous sense of joyous communality as the performers negotiate the poles with increasingly difficult moves—on all fours, on hands (legs kicking back), in groups and carrying one another. A rush of lifting ensues, bodies stacked high into OzAsia’s tiny Ukiyo tent, including head to head balances. Next, even more bracing, mass rope skipping involves all kinds of groupings, lifts and somersaults, executed faultlessly within inches of the audience. The sense of intimacy and community was bolstered by characterful performers. Tussling competitively with martial holds and lifts, two of the men stylishly flirt with a woman in the audience. One is offended when his gelled coiffure is repeatedly flattened by his partner’s handstanding on his head. The pair encounter a young child in the audience with whom they execute a rope trick, realise they have a talent on their hands and integrate her into the action as, among other things, she excitedly seeks out three hiding clowns. Other routines involve tightrope walking, monocycling the wire and ambitious pin juggling. The two women appear in traditional dress, sculpting themselves into classical Khmer statuary, hands and feet sharply angled at wrists and ankles, and balancing on each other with contortionist dexterity. The clowns take standing on a board balanced on a pipe to the extreme with moments of mock accident, real suspense and bodies stacked three high. With another pipe, a box and plank added to the wobbling pile, one of the performers heroically mounts and victoriously dismounts, keeping the whole apparatus intact. In the course of the show, largely to the side, but sometimes centre-stage, the artist paints a Buddha, a rural landscape with Angkor Watt in the background and, finally, a goddess (commenced when the two female performers invoke her). Curiously, as the whole company and audience focus on this final work, he gently blurs the image with handfuls of paint, rendering his goddess a mere impression. The performers applaud and toss the artist high in the air, a prelude to a mass dance into which are built numerous rapid lifts, a spectacular near-miss leap from one set of shoulders to another and countless drops from high into the safe hands of this impressive ensemble. 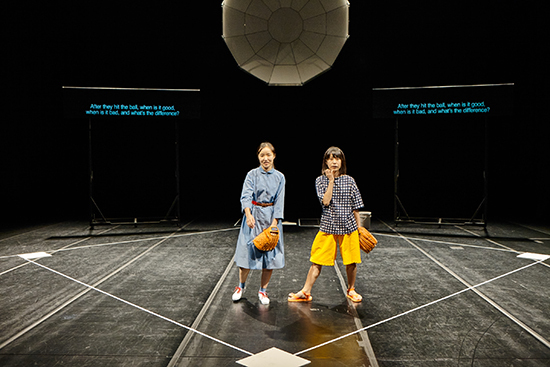 Toshiki Okada’s God Bless Baseball was one of OzAsia’s stranger offerings, a laidback meditation on baseball in which a youngish man and two young women langorously discuss the workings of the sport. The women, one Korean, the other Japanese, don’t ‘get it.’ His rather abstract explanations are unconvincing and dispassionate. At the same time, true to the work’s gentle choreographic impulse, he sways and constantly repositions himself as if limbering up for a game, revealing an easy familiarity, if not expertise, with the bat. When frustrated, he stands it vertically on the floor, leaning into it and rocking. Holding mits and stretching legs, the girls, if not taken with his account of the curious history of fixed innings, like him move about the baseball diamond which is the ground-map for the production. As an introduction to baseball, it’s basic. It feels like a Beckettian waiting game. Just as the young man has begun to open up about his complex relationship with his wife and his father (a coach for junior players], and his dislike of the game, enter Ichiro Suzuki, a famous Japanese baseballer who once played for an American team, the Miami Marlins—or is he an actor impersonating the YouTube Ichiro impersonator, Nichiro? God Bless Baseball is an often difficult work, slow moving and sometimes confusing—for example, the Japanese female character suddenly becomes the Korean daughter of a baseball fan. At times, the play requires little knowledge of the game and its Asian context, at others there’s a superfluity of information, at others it assumes too much. Of course, though internationally toured, it was written principally for audiences in Japan and Korea, countries that have shared cultural incorporation (of baseball and much else) and consequent subordination. 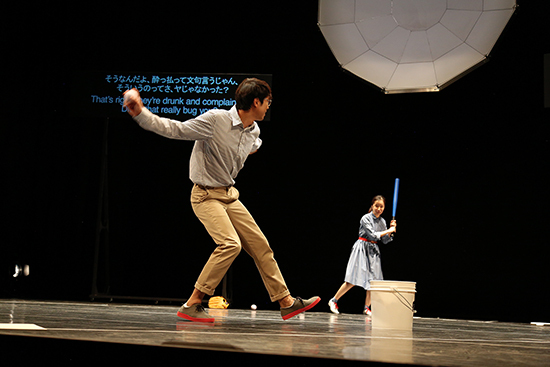 The three young performers move convincingly from passivity to resistance; Pijin Neji’s presence lifts the production to another plane with his poetic movement and ambiguous characterisation of Ichiro. Tadasu Takamine’s symbolic object is a fascinating installation in itself. God Bless Baseball is a work that requires patience and surrender for it to do its work. Like its extrovert opposite, Two Dogs, it is both familiar and alien, not at all the kind of work that Australians are making, and we are all the better for experiencing the difference. Bad weather and a consequently heavily concentrated timetable meant that I caught Beastly in its final minutes, when a generous artist agreed to one more performance. 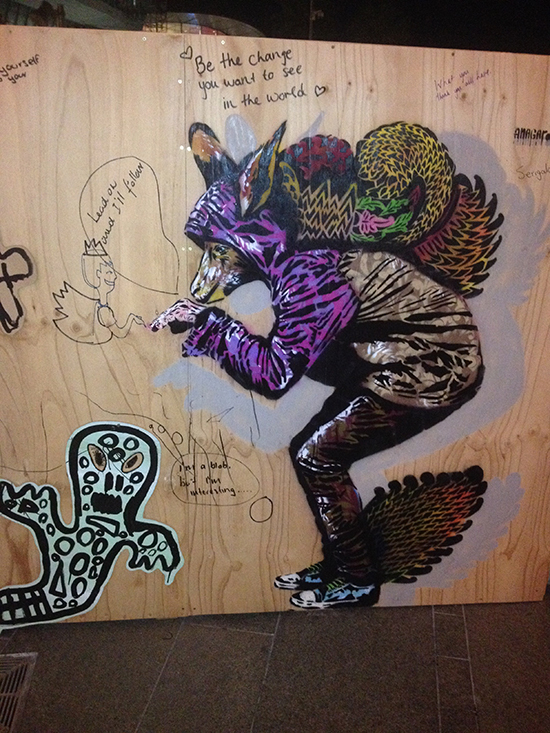 On the Festival Centre’s Riverdeck, the walls of a gathering point installation were illustrated with wonderfully lively creatures, hybrid human-animals—platypus, kangaroo and an emu-man pulled by an umbrella. From their backs spring glorious, flowered wings, suggesting transcendence and a cross-cultural merging of our fauna with Indonesian iconography. Beastly, a collaboration between Indonesian artist Andres Busrianto, Adelaide’s Tutti and Malaysia’s Stepping Stone, engagingly realises the aspirations of mixed ability artists within a cross-cultural environmentally focused framework. You can read more about it here.